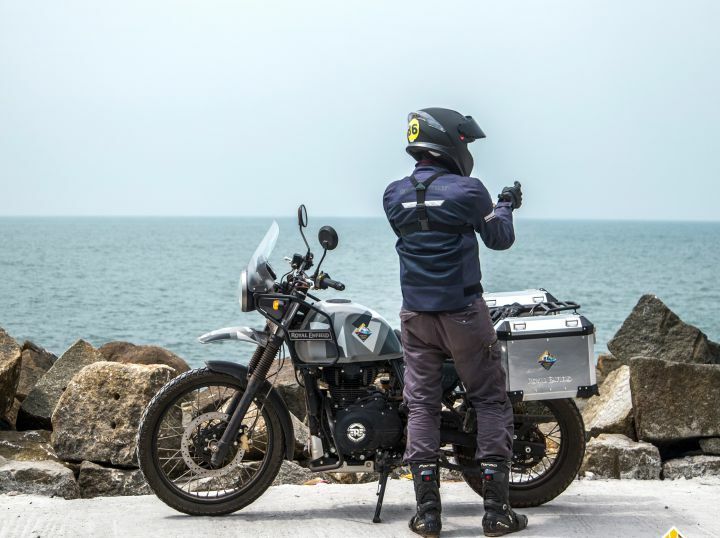 Full Disclaimer: I was never a huge Royal Enfield fan; however, over the 1,000-odd kilometres that I covered during the Coastal Trail aboard the Himalayan, I fell in love with it. Now, here’s some back story. I was earlier informed that the bike accompanying me for the 2019 Coastal Trail would be an Interceptor 650. Naturally, I was as excited as a little girl who got her first pony, specially because I’d heard rave reviews for the bike. Ok, maybe that’s a bit much, but you get the drift. Unfortunately, a week later I was told I would be given a RE Himalayan Fi instead of an Interceptor 650. Bummer, right? Well, believe me when I say this, I was naive to think that the Himalayan wouldn’t be as fun as the Interceptor. And boy was I wrong! The next week I spent in the Himalayan’s saddle would change my perception not just about the motorcycle but the brand as a whole. The bike I’d been riding came pre-fitted with Royal Enfield’s GMA (Genuine Motorcycle Accessory) parts such as panniers, a braced aluminium handlebar, CNC machined bar end weights and an engine guard. Perfect touring add-ons! My first day with the bike started off with a short ride to Chola, Goa. We meandered through narrow backroads that led us to a proper off-road section measuring around a kilometre and a half in length. The terrain had steep inclines, descents and rocky sections that’ll put your bike’s abilities to the test. Since this was my first time attempting anything of this sort, I (wisely) decided to take it slow and steady. The weight takes some getting used to, so I tried to get a feel of the bike first. And despite my lower than average off-road skills, I managed to keep the bike upright at all times. It’s the Himalayan’s turf, and the bike didn’t shy away from showing its off-road prowess. I stood tall on its serrated footpegs and manoeuvred the bike through a maze of rocks. It felt easier thanks to the wider handlebars our bikes were equipped with. While I negotiated the terrain, the softly tuned suspension surfed over undulations without any trouble. On the other hand, there were instances where the tail slid from side to side due to loose sand. A small panic attack and a wee later, the dual-purpose tyres dug into the soil, giving me some much-needed grip to regain control of the situation. It’s safe to say that the off-road capabilities of the Himalayan makes even an average Joe like me feel like a G.O.A.T. However, it’s a slightly different story on the tarmac. Sure, the bike is a good tourer and with the optional panniers, it’s even more versatile. But while there’s ample torque to feed the tyres off-road, it doesn’t have the grunt to fly by on the highways. Long winding stretches of tarmac led us to Mangalore. And though the bike sat comfortably at 100kmph, it felt a bit strained when you pushed past it. That said, if you’re not throttle-happy like I am, the bike’s a hoot to ride on the open roads. I simply kept the throttle pinned as I munched in the miles and soaked in the magnificent views the journey had to offer. The extended duration on the saddle also made me realise it’s a tad bit too soft for my liking. But there’s a workaround to this: just stand up and ride! Yes, you’re sure to get strange looks from people who aren't used to seeing this. But you could always wave out to them or throw peace signs to dial down the awkwardness. It worked for me! Another noteworthy memory was our time riding along the beach in Murudeshwar. Most of us were just cruising and exploring the beach, while some took the pleasure of slicing through the creeping ocean waters. When everyone was busy doing their own thing, I rode around aimlessly along the shoreline, gazing at the ocean and looking at the boundless beach that lay in front of me. Cruising around at relatively high speeds on the beach made me realize how planted the bike felt despite the undulations and occasional water shenanigans. This could be attributed to the extra weight of the panniers, but I’m giving the bike the benefit of doubt. Apart from this, the optional bar-end weights helped tone down the vibes on the handlebars and kept the handle arrow straight with minimal inputs from my side. Impressive indeed! The trade-off is on the tarmac where the bike feels a bit unsettled in mid-corner bumps thanks to its softly sprung suspension setup and the added weight of the panniers. Speaking of panniers, I didn’t use them for the first two days since I was under the impression that my backpack wouldn’t fit inside. Granted, I’m not the brightest soul on earth. Yes, stupidity knows no bounds. After a backbreaking two days, I finally decided to use one of the panniers to hold my backpack which was stuffed with GoPro mounts, five days’ worth of clothes, electronics and an extra pair of gloves. All of that fit comfortably in a single 26-litre pannier. I used the second pannier to store three bottles of water. This not only took the weight off my shoulders but also helped me push for longer durations without a break. On the quality front, the aluminium box panniers felt well built and ready to take a beating. Coming to answer the biggest question on every Royal Enfield sceptic’s mind. Was the bike reliable? Well, I never had any issues throughout the excursion aside from the brakes fading and the handle lock which wasn’t working. Some of the issues my colleagues came across were minor and easily fixed. Royal Enfield really seems to have worked on and ironed out most of the issues that plagued the previous-gen model. I’d even go as far as saying that the BSIV Himalayan Fi is among the best bikes Royal Enfield makes right now.